The person who was asking me was my friend. They were just curious and meant no offense by it. They were just picking my brain and were curious about why I supported the Ukrainian cause. “Must I be Ukrainian to care about the value of one’s life? Must I be Ukrainian to wish for world peace ? Must I be Ukrainian to pray for the safety of the brave Ukrainian soldiers? No! As an American, I sometimes take for granted what it’s like to live in a country I love and to have boundless opportunity. The Ukrainian people are a strong, noble people who are willing to lay down their lives for what I have. I truly find it an honor to support Ukrainians.” I could have gone on a big rant but I handled it calmly. Source: Neil deYoung post on 1,000,000 people around the world in support of Ukraine’s fight for freedom FB page, reposted with permissions. 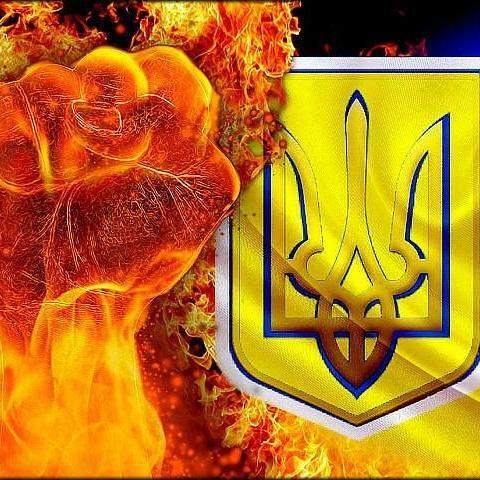 This entry was posted in "Voices" in English, English, South&Eastern Ukraine, War in Donbas and tagged Ukraine, UnitedforUkraine, we support ukraine. Bookmark the permalink. As an American college student at a large university, I’m exposed to a lot of different cultures. The only one I am not exposed to is Ukrainian, and because of this people look at me strangly when I vehemently support Ukraine’s cause and non-negotiable stance on separation from Russia and assimilation with European and western practices. This conflict, although not directly affecting me as of yet, has changed my life already. I recently starting learning Russian in the classroom and Ukrainian at home. As an economics major, I became interested in US business/diplomatic relations with Ukraine, and hope to help them build their New Democratic state when I am done will my degree in economics in anyway I can. I see the “writing on the wall” (so-to-speak) that is tough to ignore now that the game has gone on this long. I asked my 93 year old great grandfather a few weeks ago, who was a soldier in WWII about the attitude of the people in the US before the war. In his explanation, he said it didn’t seem that different for him today than in 1940 when he joined the national guard. I only wish there were more of my fellow citizens who saw what myself and so many others around the world see; Ukraine is a wake up call, and Americans should not repeat history and put our heads in the sand as we did in the 30’s. You’re amazing. So true. Thank you for your perspective on it, it’s a valuable one. And best wishes for your studies and what you do in the world after you graduate! Such a wonderful comment. Your reply has given me much hope. Thank you. In their current tribulation, Ukrainians are Everyman. They are fighting for the whole of mankind. We all resonate with their fight, because it is everyman’s fight. They fight for the deepest value known to man – freedom. Without (true) freedom we cannot reach our full human potential. Without freedom we cannot be truly alive. Whether we seek freedom from the school bully in childhood, or from the manipulative fellow worker, or from the lying acquaintance, or from a bullying and manipulative and lying Government, it is all the same battle – for truth, for honesty, for goodness, for integrity. The struggle of the Ukrainian People is not dissimilar to the struggle of colonial Americans who struggled and fought for the opportunity to have a country who could control its own destiny, free from the influence of its “mother country”. It was an amazing and wonderful thing to see the people rally against an oppressive government and work together to form a more representative form of government. The Breech by Russia into Crimea, however, is a completely different matter! That was an act of Russian aggression pure and simple! NO country should be allowed to do that to another!! It is an illegal act and one that should be dealt with harshly! As a secondary consequence, it also serves to distract from the Ukrainian people’s task of putting together and holding accountable leaders who will fulfill the mandate of the people to implement the kind of reforms so desired by the populace in Lukashenko’s ouster. Crimea rightfully belongs to Ukraine! May the Ukrainian people find their rightful voice in government. Prior to the troops entering Ukraine from Russia, I never read of any incidences of Ukrainian oppression of ethnic Russians in Crimea or anywhere else! This only underscores that Russia took an opportunistic tactic to seize land to which it is not rightfully entitled, and to undermine the voice of the people to create and maintain the government it so rightly wants and deserves! Thank you Robert for your articulate assessment! Au départ en suivant, un peu de loin les info…et puis l’hiver avançant, les vôtres étaient toujours sur la place Maïdan bravant le froid et la violence policière…avec pour bannière le drapeau européen ! Une aventure humaine extraordinaire, solidaire et structurée, organisée qui s’essayait à un nouveau mode de gestion collective. J’ai commencé à chercher ou était l’Ukraine sur une carte, je l’avoue… ! De fil en aiguille, je me suis intéressée à votre culture, vos coutumes, votre histoire…pour comprendre qui vous étiez. Comment et pourquoi un peuple désirait avec tant d’ardeur faire partie de l’Europe, alors que nous la dénigrons, qu’elle est souvent vécue comme une source de contraintes et de réglementations, pour d’autres une dilution des cultures et spécificités de chacun…et l’euro…qui rappelle que nous avons perdu du pouvoir d’achat…les populismes naissants dans beaucoup de pays membres ! Ensuite, il y eu la terrible periode de fin février…ou là des personnes ont perdu la vie, pour leur liberté, pour leur idéal d’ un état nouveau, démocratique et européen. Parce qu’à leur insu, ils ont intégré des idées dont ils ne savaient même pas qu’elles étaient de la propagande FN sur la dangerosité de l’Europe, sur le fait qu’il faut fermer les frontières pour sortir de la crise éco et supprimer l’euro… je les ai d’ailleurs emmené l’été dernier à Verdun (voir un spectacle son& lumière, fait par des français et allemands, sur les horreurs de la 1 ère guerre mondiale), pour qu’ils comprennent que la construction de l’Europe a été un réel rempart contre les guerres fratricides. J’ai ressenti l’urgence de le faire, tant la montée des extrêmes (que je surveille depuis 1982) me parait préoccupante. Et cet hiver, votre peuple donnait corps à cette dimension, en rendant positif le fait de désirer être européen, cela donne tout son sens aux valeurs démocratiques de cette union bien qu’imparfaite. Parallèlement, j’ai senti le souffle de la désinformation sur l’actualité ukrainienne, la désinformation pour renforcer Poutine, les ramifications, une fois encore avec les populismes qui cherchent la déstabilisation… et la diabolisation. Merci beaucoup, Agnès! magnifiquement dit! Ukraine represents man’s most noble aspirations for peace and freedom from foreign tyranny. The question should rather be what American cannot support Ukraine’s sacred quest. No, the country is not perfect but compared to the savage Kremlin invading host that plagues them they are very nearly angelic. They aspire to peace, self-determination and prosperity and are fighting to not have these democratic ideals violently wrested from them at their very birth. Not to support Ukraine would be to turn my back on America’s own tumultuous and revolutionary birth, something that the very core of my being could never broach. Salva Ukraine! If you are American or Canadian and have had exposure to the wonderful diaspora Ukrainian community, then it is impossible NOT to support Ukraine and it’s people.